Archives for London (AfL) are excited to share details of this year’s conference. Please see below for abstracts of the day’s speakers. Advance booking is essential. Please book your place through Eventbrite http://tinyurl.com/AfLevents or by contacting Alex Fisher (Secretary) on 020 7594 8818. The premis of Anne’s recent book on women at Imperial is that contrary to popular belief, women have always been at Imperial College, albeit outnumbered by men. Nonetheless women and men have worked side by side at Imperial from the 19th to 21st centuries, to the extent that now, a woman is the President (Vice Chancellor). Gradually, society is realising that science and engineering is not a gender specific matter, and Imperial, the lead scientific university in the UK, embraces this view. In the writing of the book, much use was made of archive material, oral history recordings and interviews. The National Archives has a world-renowned collection of documents relating to the 20th century women’s suffrage movement. Their centenary programme Suffrage 100 has aimed to work across audiences to engage people in new ways. Vicky Iglikowski will introduce 100neHundred, a collaborative dance project with Combination Dance. Through this project dancers told the story of the suffragettes and the progress that has been made over the last century. How can we use archival records and dance to get young people to learn about rights and democracy now? Katie Fox will introduce Suffragettes vs. 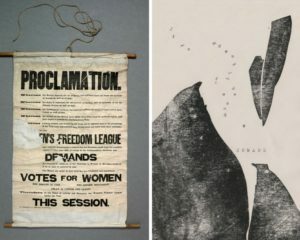 The State, an exhibition which uncovers the composition and complexity of the militant suffrage campaign and reveals the state’s response to their actions. Is it possible to uncover the inner workings of a militant organisation, and the motivations of its members, through documents created by the state? Rowena Hillel will introduce Suffragette City, an immersive recreation of the life of one militant suffrage campaigner inspired by documents held at The National Archives. Is it possible for the public today to gain a deeper understanding of the lives of suffragettes through site-specific experiences? An overview of current practice based PhD research in progress which explores the use of visual storytelling to describe and share site specific social narratives, particularly those that might otherwise be difficult to engage with or access. Rather than the grand historical narrative it has always been the anecdotal or ‘vernacular’ history that has compelled; the informal story that belies the experience of the everyday. The intention is to explore how this knowledge is preserved within the location of experience and how this information is then archived and utilised. The presentation will introduce the current case study an illustrative interpretation of the prison diary of the Croydon Suffragette Katie Gliddon who was detained in Holloway following her involvement in the mass glass smashing campaign of 1912. Mireille Fauchon is practice based PhD research candidate at Kingston School of Art. She is the illustration editor of Ambit magazine and lectures at the Royal College of Art. 2018 marks the 100th anniversary of the Representation of the People Act 1918, which gave all men and the first women the right to vote, and as such is one of the most important centenaries in our democratic history. Parliament is marking the centenary with the Vote 100 Project, a range of activities including ‘Voice and Vote: Women’s Place in Parliament’, a major free public exhibition in Westminster Hall during summer 2018. In this talk Mari Takayanagi, co-curator of Voice and Vote, will explore the history of women and Parliament over the last 200 years using previously little-known archives and works of art, and taking you on a journey through historic spaces used by women in Parliament including the Ventilator, the Cage, the Tomb and the Chamber. Dr Caitríona Beaumont is an Associate Professor in Social History in the Division of Social Sciences, LSBU, Director of Research for the School of Law and Social Sciences and a member of the School’s Gender and Sexualities Research Group. She has published widely on the history of female activism, women’s organisations and the women’s movement in nineteenth and twentieth Ireland and Britain. Her latest book is Housewives and Citizens: Domesticity and the Women’s Movement in England 1928-1964 (2015). Bishopsgate Institute’s Special Collections and Archives have held material relating to women’s history since opening in 1895, but the past few years have seen a significant increase in its holdings relating to feminism and campaigns for women’s rights. The Library now holds significant collections on behalf of the Feminist Library, including their pamphlet, poster and ephemera collections, along with numerous archives of campaigning women and organisations. Its LGBTQ+ and alternative sexuality collections are also a must-see for anyone wanting to understand sexuality and gender in 20th- and 21st-century Britain. The Institute’s commitment to contemporary collecting has also seen further additions, including placards and digital material from the Women’s Marches of 2017 and 2018. This talk will investigate these collections further and how the Institute has developed its feminist and women’s history holdings.